The various videos from the 6-a-side, 11-a-side and overseas tour documentaries and footage are all now located on our YouTube page. We also have a limited presence on Vimeo. The majority of the games are now in the minimum 1024 x 576 format, which is the basic DVD standard. The later videos are in 720p HD. There is no copyright on any of the videos, so feel free to download and share. Due to our involvement in grassroots and amateur football since the mid-90's, Sassco can provide a range of services at a low cost for similar minded individuals and groups involved in football. Sassco can provide badge embroidery of any style. The badges can be thin material, thick material with borders as well as a glue on (with heat) backing or without. Please contact us with your requirements. Payment is required in full and the turnaround is around two weeks from approval of the artwork. We can also provide a sew on service for around £3 per badge to be sewn on. 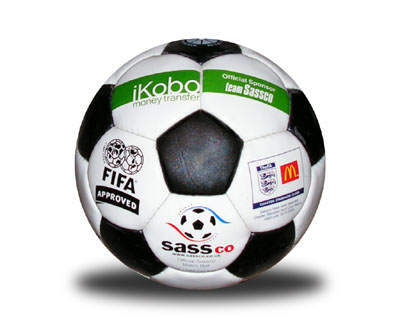 Sassco have provided official matchballs for use within the WCFL and can now provide match standard (up to FIFA Approved) balls with your own logos on and in your own style. 70% of the full cost is required in advance and the remaining 30% payable before the balls are delivered. The turnaround is around three weeks from approval. Sassco can also source low cost football equipment, kits, etc. Please contact us with your requirement and we'd be happy to provide a price for anything required. About Sassco, 5aside, 6aside and 11aside.